The weather here in Atlanta has been nothing short of fantastical, and my family has basically been living in the backyard, soaking it in. 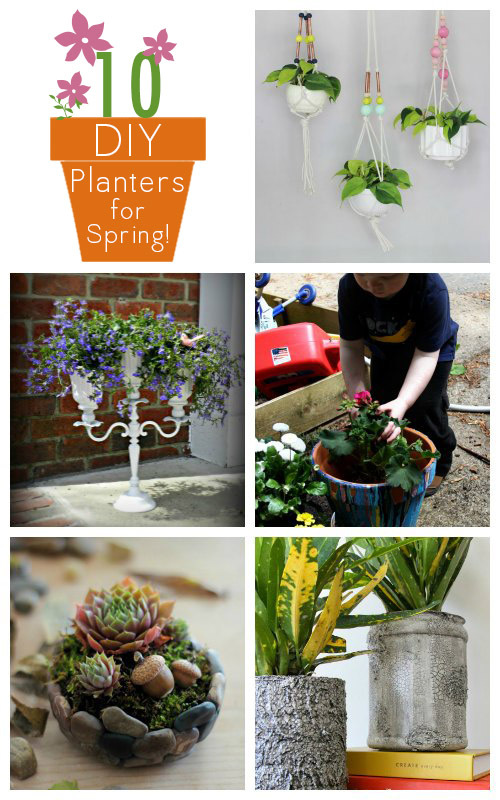 Get your backyard spring-ready or bring some spring beauty indoors with these DIY planters. They’ll work inside or outside. 1. Copper Pipe Planters – I love the modern look of this macrame planter from A Beautiful Mess. It would look lovely hanging in a sunny window or on a porch. 2. Candelabra Planter – Redhead Can Decorate turned an old ceiling fan and candelabra into a functional indoor or outdoor flower planter. 3. Faux Stone Planter – This little polymer clay planter from Lucy Akins is perfect for showing off your favorite succulent. 4. Tin Can Planter – Making a planter from a tin can sounds easier than it is, though it’s still super duper easy. Get the deets at Crafting a Green World. 5. Recycled Hanging Herb Planter – You can’t recycle mesh produce bags, but they give the right amount of drainage for making a sweet hanging herb planter. 6. Gratitude Planter – Heather bills this as a Thanksgiving craft, but I think that these pretty chalkboard pots would work well as part of your spring decor, too! 7. Poured Paint Planter – Turn a plain terra cotta pot into a colorful decor piece! 8. Faux Stone Planters – Bonnie at Revolutionaries turns old coffee canisters into chic planters with a faux stone finish. 9. Switch Plate Planters – It’s sort of amazing how replacing yellowed old switch plates makes a room look fresher. Don’t toss the old ones, though! Turn them into cute little planters with Apartment Therapy’s instructions. 10. Upside Down Planters – Design Sponge has a beautiful, recycled spin on those old As Seen on TV Upside Down Tomato Planters. And you can plant so much more than tomatoes in them!